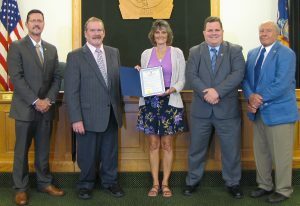 OSWEGO – The Oswego County Legislature recently recognized the town of Granby on its bicentennial. Pictured from left are Oswego County Legislature Chairman Shane Broadwell, District 17; Legislator James Karasek, District 22; Granby Town Clerk Janet Ingersoll; Legislator Daniel T. Farfaglia, District 24; and Legislator Morris Sorbello, District 23. The town was officially formed on April 20, 1818. Farming and industry were the foundation of this 46-square mile township. It was once a shipping depot for vegetables bound for New York City and hosted trades such as paper manufacturing and cigar-making. In the late 1800s, Granby was the fourth largest tobacco producer in the state. In its heyday, the town hosted the Battle Island Starch Factory, two sawmills, a cheese factory, post office, hotel, and grocery store. Battle Island State Park, an 18-hole golf course, was created in 1938 and offers spectacular views of the Oswego River for golfers. Granby is hometown to George Salmon, who participated in the famous “Jerry Rescue” in Syracuse and was tried under the Fugitive Slave Act of 1850; as well as 19th century author, poet and historian Richard Edwin Day.